HELLO SKI SEASON 2019-2019 We are located SLOPE SIDE at Wintergreen Resort, an amazing FOUR SEASON RESORT perched on 11,000 acres on the eastern slopes of the Blue Ridge Mountains - spectacularly designed for outdoor lovers! GET YOUR SNOW HERE! Mid-week dates still available! SKI IN/SKI OUT Considered one of the best locations on the mountain. Diamond Hill is on a Green Slope - start off easy and ski right out the back door!! Overlooks Terrain Park, Blue Ridge Express 6 pack lift, and is lit for night skiing. It has it all. This end unit with front and side view/access to the slopes books fast - check out our calendar to secure your spot. Mother nature, plus the new turbo charged snow guns have given us more snow, slopes opened sooner and the season lasting longer! INSIDE 921 DIAMOND HILL The open living space is perfect for gathering with family and friends. The kitchen is the heart of the great room featuring granite counter tops, stainless appliances and it is fully equipped for anyone that loves to cook. Light a fire in the fireplace and dine casually overlooking the mountains or at the elegant bar with bar stools. Hang out on the new refurbished deck and enjoy your favorite meal - or walk to one of the resort restaurants and let them do the cooking for you. At rest or play, this is an amazing location for a trip to Wintergreen. SLEEP. When it's time to call it a day - you will sleep well on high quality bedding. The primary bedroom features a comfy queen bed with premium sheets and linens, as well as a Sony HD flatscreen TV. The attached bathroom has a large vanity area and private river pebble walk-in shower. The second bedroom has two twin bunk beds- this room also has excellent bedding and cozy linens. It's great for kids, but comfortably designed for teens and adults too. PARKING. Diamond Hill has private gated parking, an access code is required to enter. We are ground level with the parking lot - park right at the door and only a handful of steps into the condo. You do not have to carry your equipment up and down a long flight of stairs! FIREWOOD - Free and fully stocked at the back door. OTHER GOOD STUFF. Air conditioning, Washer/Dryer in the unit, crock pot, board games, movies, and iHome music and iphone charging stations. THANK YOU! For viewing. Please feel free to ask for more information and availability. You can email me or text me. Or use the BOOK IT NOW option to secure your reservation immediately, and access our hospitality page to start planning your trip. Check out our condo, very close to Diamond Hill - at Three Ridges. Nice for families and friends that want to vacation together but need two places. It is VRBO property #755529 - one bedroom, one bath, sleeps 4-6. A full renovation has just been completed. 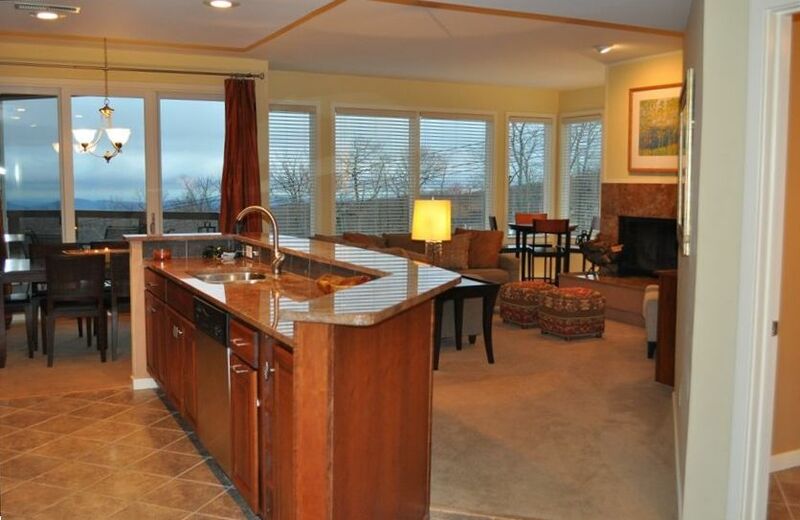 SKI/SNOWBOARD – Ski-in/Ski-out from our premier Diamond Hill condo right on the slopes! The best location for easy on and off the slopes, ground level, and overlooking the terrain park for watching or playing all day long. ANYTHING OUTDOORS– and awed by the beauty of the mountains! The nature center will guide you to hiking trails for all ability levels – find waterfalls, amazing rock formations and the incredible views of the spectacular Blue Ridge Mountains. Go hiking, biking, horseback riding, fly fishing and more. Check out the new Zip Line! GOLF – stay and enjoy Wintergreen’s top rated Champion Golf Courses and fantastic bars and grills. TENNIS - Tennis Magazine has named Wintergreen one of the best family tennis resorts in the country. An excellent indoor/outdoor tennis facility , clay courts, and fantastic pros on staff offering daily round robins, and private or group lessons. SWIMMING POOLS – The Aquatics Center has indoor and outdoor pools with panoramic views from the top of the mountain, and outdoor hot tubs. LAKE MONACAN - It's very unique to find a sandy beach, beach chairs, swimming rafts, paddle boats, snack bar on a beautiful lake nestled in and surrounded by mountains. That's Lake Monocan. A very cool all day activity, great for kids. Use our guest passes for full access to the lake. Welcome! I'm Stephanie Snyder, I live in Richmond, Virginia originally from Holland, Michigan. I love being outdoors, Wintergreen has been the perfect choice for a get away property. I chose 921 Diamond Hill for the fantastic location. Slope side is ideal in the winter for snow sports and skiing out the back door, and I also really like being close to the main lodge and being able to walk to the restaurants there. While the ski season is full of energy, my favorite time of the year is the peaceful off season. I'm an avid tennis player and the facility (on top of a mountain) is gorgeous - clay courts and awesome pro's. Same for the golf courses and Spa. Wintergreen is so unique and special in that no matter where you are or what you are doing - you are surrounded by mountain scapes and vistas. Just amazing! After several years, I decided to list it on VRBO in 2008 to make it available to other families when we aren't there. It's been fun to share it! Diamond Hill was built in the 80's when mauve was the big color in design. This one had just been fully renovated and modernized to a gold rating - we do periodic refreshes with paint and furniture to maintain that standard. I love the open floor plan for hanging out and overlooking the mountains . . .it's beautiful. I believe a vacation property should feel a bit luxurious with a nice attention to detail to make the time away that much more memorable. When the resort privatized a few years ago, I invested in the WINTERGREEN CLUB MEMBERSHIP for my family, friends and for our guests to be able access all that the resort has to offer. The guest passes are included with a stay at 921 Diamond Hill, and give access to all resort amenities - as they are REQUIRED to use the golf courses, tennis facility, Equatic Center/pools, spa, and Lake Monacan. Elegant granite, ceramic tile and cherry cabinets - fully stocked anyone who loves to cook. This was our 5th time staying here and we absolutely love it! The location is perfect for skiing in & out easily and the property is wonderful. This was our first visit to Wintergreen and we really enjoyed staying at this property. It is a great location and an updated, comfortable interior. Minor issue is that the upper slat of the safety rail of one of the bunk beds was broken and had been duck taped. Also in the bunk room, the heater is located behind a side table. For safety and access, we had to move that piece of furniture away from the heater when operating it. Overall, we had a pleasant stay and would highly recommend the property. Very nice,had all amenities. really enjoyed fireplace and mountain view. We enjoyed condo very much. Just don't understand why all of wintergreen shuts down at 5pm.no restaurants no skiing after 5. We had a great time at Wintergreen and thoroughly enjoyed our stay. The slope directly in front of the condo was not open as it was warmer and they were not able to blow snow but we were able to access the other slopes very easily. We were able to put on our ski boots and walk to the next slope, put on our skis and we were were off! The condo was nicely outfitted for our family of 5. The three kids shared a bedroom and there were two sets of bunk beds so everyone had a spot in the room. The master bedroom was right next to the kids bedroom and had a nice ensuite bathroom with an updated shower. We really enjoyed the heat fans in the bathrooms! The fireplace worked great and we had no problem building a fire, we brought our own firestarter and matches. Plenty of seating at the kitchen table as well as extra seating for four by the windows-perfect spot to watch the terrain park. The glass door in the master bedroom lock at the top doesn't work but we did find there was a lock at the bottom of the door that worked perfectly! The washer and dryer are a little older but once we figured out how it worked, it was great! We were also missing some towels and when we contacted Kim she responded right away and told us they might be in the dryer so we checked there and had enough towels and wash cloths. Overall a great stay and Kim was very responsive when I texted the night we arrived! Beautiful view, ski in ski out, fireplace, games...perfect group outing accommodations.